"The people who are fleeing Syria are the most harmed by terrorism, they are the most vulnerable," he tells a news conference in Turkey. "It is very important that we do not close our hearts to the victims of such violence and somehow start equating the issue of refugees with the issue of terrorism." 16:03 GMT - French President Francois Hollande says parliament will this week begin examining a bill extending the state of emergency by three months. "I decided to ask parliament starting Wednesday to examine a bill prolonging the state of emergency for three months," he says, calling on lawmakers to "adopt it by the end of the week". He also calls for the French constitution to be amended to "allow the authorities to act... against war-level terrorism". 16:06 GMT - Norway's police, who were to stop wearing their service weapons this week, will remain armed until December 1 because of the Paris attacks, Norwegian authorities say. Uniformed officers have been exceptionally authorised to wear their firearms on their belts since November 2014 due to a heightened threat of Islamist attacks. In ordinary circumstances, police keep their firearms locked in their patrol cars. 16:15 GMT - Britain's interior minister Theresa May says she will be lobbying her counterparts across Europe for tighter gun laws. Speaking in parliament, the Home Secretary said tight British gun laws mean the type of weapons used by the terrorists on Friday were not "readily available" in Britain. But she added: "We must therefore focus on firearms entering and moving throughout the EU and ensuring we have the right capabilities at the UK border to detect firearms being smuggled in." 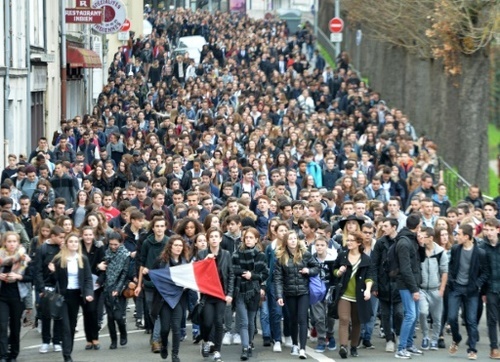 "Terrorism will not destroy the French Republic, because it is the Republic that will destroy terrorism". 16:28 GMT - The official COP 21 Twitter account quotes Hollande: "The climate conference will not only still be held, but it will be a time of hope and solidarity". 16:30 GMT - A leading Sunni Muslim cleric has called for an ideological battle against IS, including the deployment and training of moderate clerics in Europe to counter extremist thought. "It primarily requires an intellectual treatment," Abbas Shoman, the deputy sheikh of Egypt's Al-Azhar institute, tells AFP, adding "it should not be limited to security treatment." Al-Azhar head Sheikh Ahmed al-Tayyeb, condemning the attacks, described them as contrary to religion, and added: "The problem is, those who control religious discourse, they and their stances should be reviewed." 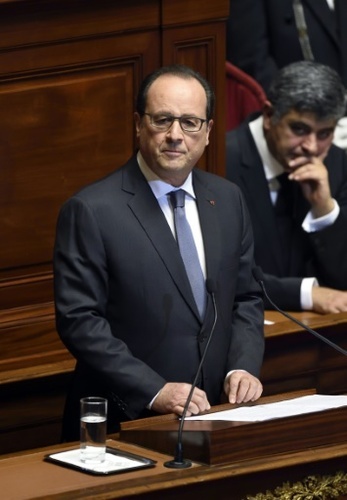 16:36 GMT - Hollande's long and solemn speech to parliament rounded off with a rendition by lawmakers of the Marseillaise, the French national anthem. 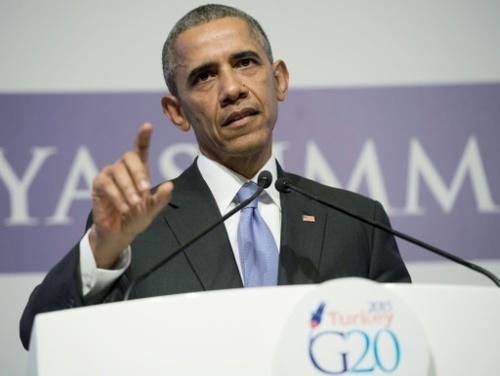 In the fight against the extremists, the French president said he wanted increased international assistance, adding: "I will meet in the coming days with US President Obama and President Putin." 16:49 GMT - Republican presidential hopeful Donald Trump says the US should "strongly consider" shuttering some mosques as part of efforts to prevent extremist attacks following events in France. "You're going to have to watch and study the mosques, because a lot of talk is going on in the mosques," Trump tells cable broadcaster MSNBC. 16:53 GMT - A British court has remanded in custody a 41-year-old Frenchman who sparked a security alert after allegedly walking into London's Gatwick Airport with an air rifle and a knife the day after the Paris attacks. The busy hub's North Terminal was evacuated for several hours on Saturday and Jerome Chauris, unemployed and of no fixed address, was arrested. 17:27 GMT - The brother of wanted Paris attacks suspect Salah Abdeslam says that he does not know where he is, adding that his sibling is a "normal lad". "As far as my brother is concerned, we don't know where he is right now," Mohammed Abdeslam tells Belgium's RTL television at his family home in Brussels after he was released by police without charge after two days in detention. 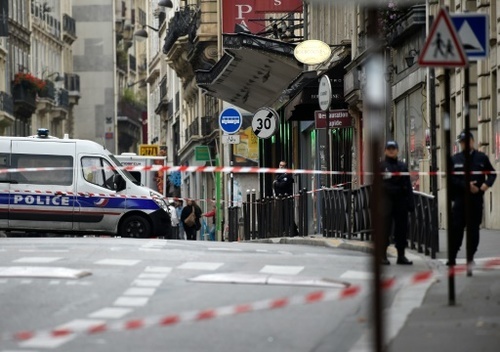 Police set up a cordon around the area where a suspect package was found in Rue De Clichy in the ninth district of Paris, as France continues to be under a State of Emergency. 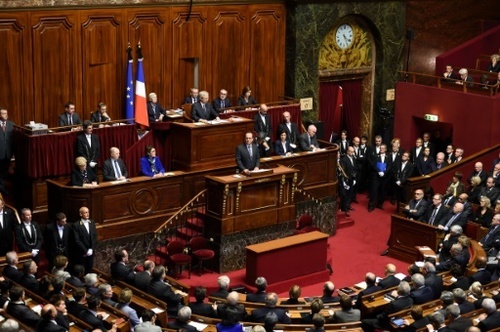 17:30 GMT - President Francois Hollande's speech is only the second time in more than 150 years a French president has addressed a joint session of parliament. Describing the coordinated attacks that killed 129 people as "acts of war," Hollande urged a global fightback to crush IS and said he would hold talks with his US and Russian counterparts on a new offensive. "The need to destroy Daesh (IS) ... concerns the entire international community," he told lawmakers, who burst into an emotional rendition of the La Marseillaise national anthem after his speech. 17:40 GMT - Tonight the Eiffel Tower is lit up in blue, white and red to represent the French tricolour. 17:42 GMT - Armed police will be deployed around London's Wembley Stadium at an international friendly between England and France on Tuesday as part of increased security measures, a senior officer says. "We want everyone coming along to the match to know that officers will be out there in increased numbers, to keep them safe," Deputy Assistant Commissioner Peter Terry of London's Metropolitan Police Force says in a statement. Friday's attacks touched football particularly closely, with three suicide bombers blowing themselves up outside the Stade de France as France played Germany. The front of London's Wembley Stadium is illuminated with French flags and the country's motto, "Liberte, Egalite, Fraternite"
17:53 GMT - Among those attending tomorrow's football match between England and France will be Prince William and London mayor Boris Johnson. "Of course we can never be complacent, and tomorrow's game will be policed appropriately, but I can't think of a better riposte to this ideology of hate than to carry on with our lives, our loves and our passions," says Johnson. 18:00 GMT - French Lawmakers also held a minute of silence at the start of the exceptional meeting of both houses of parliament. A minute's silence was observed around the world earlier today, from the Bataclan music venue in Paris, where 89 of the attack victims died, to the G20 summit in Turkey. 18:31 GMT - Almost an hour after the minute of silence, the skies in Lyon, southern France were transformed into a tribute to the victims of the Paris attacks. A mysterious pilot drew the symbol "Peace for Paris" in the sky, captured by many on Twitter. The mystery man turns out to be Walter Dintinger, founder of Oui'Up, a startup that specializes in skywriting. "I had already done it for Charlie. I asked myself what I was going to draw, and I chose the peace sign + Paris. 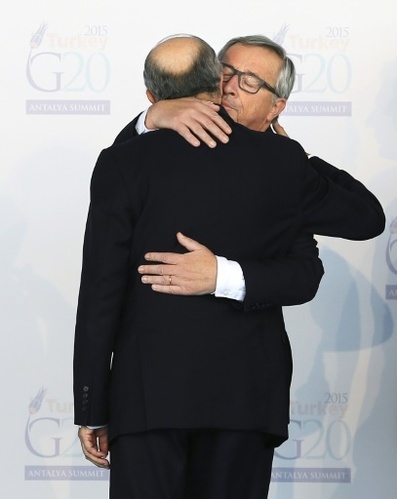 People need to be comforted after everything we have seen in media," Dintinger tells AFP. 18:40 GMT - French President Francois Hollande will meet US Secretary of State John Kerry in Paris early Tuesday, the French presidency says. They will hold talks at the Elysee Palace from 9:40 am (0840 GMT) in the wake of the attacks on Paris that left 129 dead, a statement says. 18:46 GMT - Investigators probing the deadly Paris attacks have so far identified five of seven gunmen and suicide bombers whose bodies were found at three sites across the city, while the hunt is on for others. 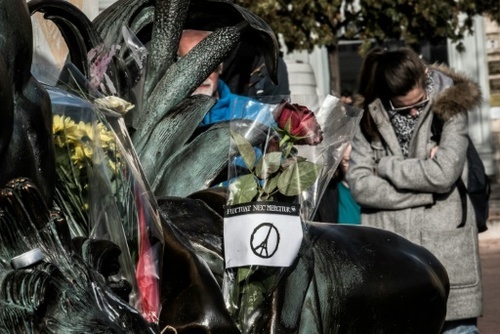 Following is a look at the men behind France's worst-ever terror attacks. 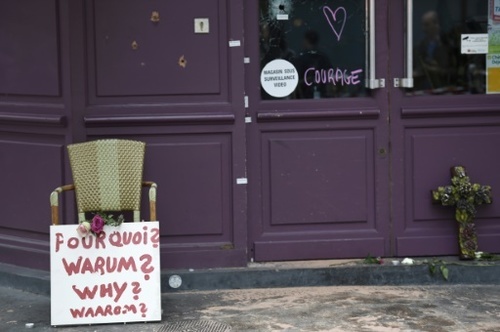 18:46 GMT - The 29-year-old French national blew himself up at the Bataclan music hall, one of three attackers who killed 89 people at the venue in the bloodiest scene of Friday night's violence. His identity was confirmed using a severed fingertip found at the site. Born on November 21, 1985 in the poor Paris suburb of Courcouronnes, Mostefai was known to police as a petty criminal with eight convictions between 2004 and 2010 but spent no time in jail. He had been identified by the authorities in 2010 as having been radicalised but had never been previously "implicated in a terrorist network or plot", the Paris prosecutor said. He is believed to have travelled to Syria in 2014, slipping under the authorities' radar. 18:48 GMT - The second Bataclan suicide bomber to be identified was a 28-year-old from Drancy, a northeastern suburb of Paris. He was known to anti-terror investigators after being charged on October 19, 2012 with "conspiracy to commit terrorism" for planning an attack in Yemen but was released on bail. He left for Syria on September 11, 2013, violating the terms of his bail, and prompting judges to issue an international warrant for his arrest. 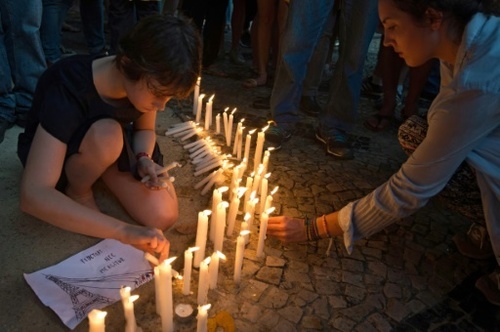 18:51 GMT - The 20-year-old was one of three assailants who blew themselves up outside the French national stadium, killing one person, as France was playing Germany in a football friendly attended by 80,000 fans, including French President Francois Hollande. 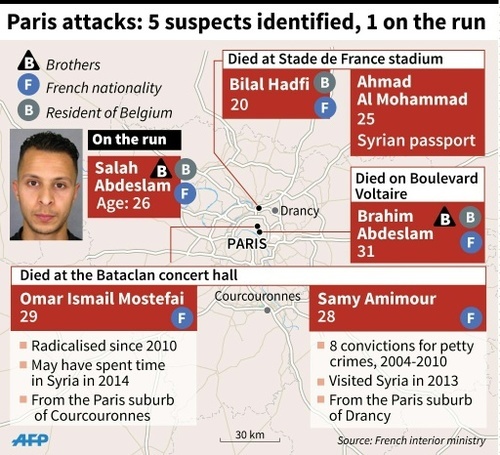 18:52 GMT - Close to the body of a second bomber outside the Stade de France, investigators found a Syrian passport in the name of Ahmad al-Mohammad, who was born on September 10, 1990 in the Syrian city of Idlib. A passport bearing that name had been registered on the Greek island of Leros on October 3, with the attacker's fingerprints matching those taken during the registration process. The holder of the passport was later registered as crossing from Macedonia into Serbia where he formally applied for asylum, Serbian officials said. But investigators are still trying to verify if the passport is indeed genuine and the name is not known to French anti-terror police. 18:52 GMT - Brahim Abdeslam, a 31-year-old French national living in Belgium, blew himself up outside a bar on Boulevard Voltaire, seriously wounding one person. Born on July 30, 1984 he is one of three brothers linked to the probe. 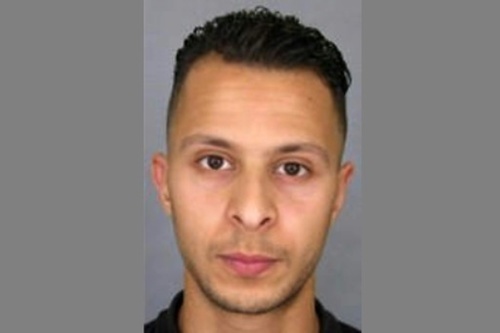 His younger brother, 26-year-old Salah Abdeslam, is currently being sought by French investigators, who have issued a photograph of him, describing him as "dangerous" while Belgium has issued international warrant for his arrest. Earlier today Brussels police surrounded a property in the impoverished Molenbeek district, but did not find him. The third brother, Mohamed Abdeslam was arrested in Molenbeek on Saturday, but released "without charge" today, with his lawyer saying her client had an alibi and was not in Paris on Friday evening. 19:18 GMT - Sweden's government and parliament say they received unspecified threats. The authorities did not give details of the nature of the threats, saying the country's intelligence agencies will determine the perpetrators and their credibility.